Viridor has the UK’s largest network of 300-plus waste facilities, including 20 large-scale recycling and 12 energy recovery facilities (ERFs), with four in commission or under construction. Each year, Viridor manages more than 7.6 million tonnes of resources and enough energy to power more than 380,000 homes. By transforming waste into high-quality raw materials and renewable energy, we make a big contribution to improving the UK’s resource efficiency. To ensure our industry can continue to develop, investing in both the current and next generation is paramount. Viridor’s head of talent and learning, Johanna Wilson, says: “Our learning and development support staff at all levels, helping to increase productivity, job satisfaction and safety, as well as developing our next generation of leaders. This year will see Viridor’s strongest response to learning and development to date. Viridor has partnered with award-winning vocational training provider System Group. This will up-skill and develop pivotal business functions such as engineering, project management, leadership and operational teams. The year-on-year increase in apprenticeships across waste and recycling is promising, with apprenticeship numbers at Viridor set to triple this year. The apprenticeship landscape has changed significantly in light of the government’s new apprenticeship standards, meaning apprenticeships are now on offer at all stages of the employee development lifecycle – from entry level through to executive level. Wilson says: “The new apprenticeship standards mean we can take full advantage of structuring internal development, qualifying it for levy funding while prioritising development to meet some of our key skills challenges. Viridor’s current ERF apprentices are a tribute to the benefits apprenticeships bring to the industry. The 13 ERF apprentices have been praised for their ability to promote innovation, with four apprentices winning or being nominated for national and local awards. Second-year ERF apprentice Will Antrobus, 18, says: “I had just left school and was eager to get into the engineering industry. There are benefits to the community as it prevents unemployment in young people, which is a challenge for young people today. Viridor’s Graduate Management scheme, which launched in 2012, is also expanding this year, giving graduates the opportunity to learn about how a business works and apply their knowledge from university to working life. With the aim to invest in future leaders, Viridor has developed several higher education initiatives to bridge the gap between job skill and managerial ability for those progressing through the company. The innovative ‘Viridor degree’ programme with Edge Hill University has provided a progression route for approximately 40 middle managers since 2012, with a further 45 recently enrolled to the new Level 6 Chartered Manager Degree Apprenticeship (CMDA) programme. Future business leaders have also been given the opportunity to up-skill through the Executive MBA offering with Cranfield University. The industry needs the next generation of talent to make tomorrow’s challenges achievable. We, therefore, need to promote science, technology, engineering and maths (STEM) in the education system today. Doing so is two-fold. It opens up the minds of young people to be inspired with STEM, promoting informed career choices. Secondly it helps the next generation develop positive attitudes and behaviours towards waste. Many of Viridor’s ERFs boast dedicated Education Centres, which welcomed over 19,000 students, community groups and customers last year alone. 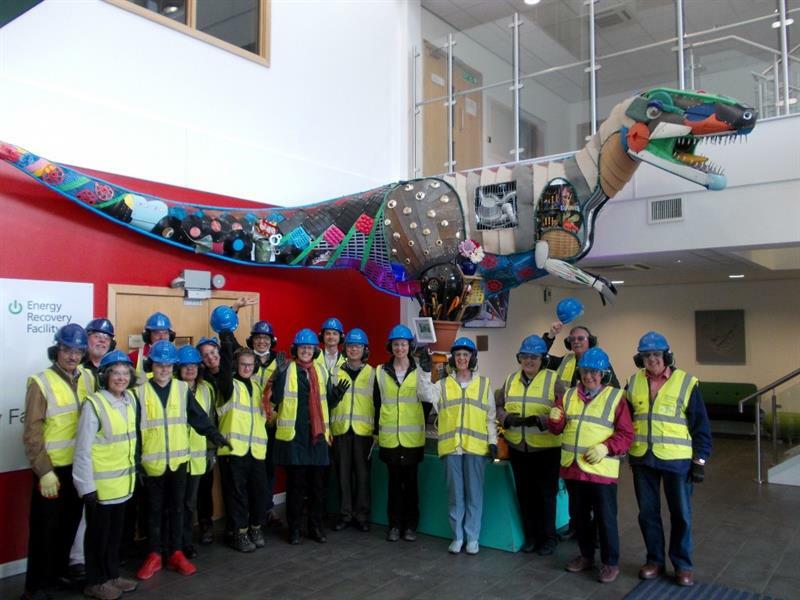 Jessica Baker-Pike, education and visitor centre officer at the Ardley Education Centre in Oxfordshire, says: “Our Education Centres illustrate how STEM knowledge taught in schools is used in the real world to maximise the benefit from materials in bins. Viridor also works closely with communities near facilities to provide funding and support for local education initiatives. Last year, Viridor was shortlisted for the Business in the Community 2017 Award for Education in recognition of continued positive community impact through its partnership with The Bicester School and Sixth Form College in Oxfordshire. The school has seen an increase in the number of girls taking up STEM subjects as a result of the partnership directly reaching 664 students between Key Stages 2 and 4. Viridor also worked with six female students from the school on an Engineering Development Trust (EDT) project which ranked in the top four of 1,000 entries. Tim Marston, deputy head at The Bicester School, says: “The education team at Ardley has transformed the way in which our students see the world of science and engineering. Together, a diverse and varied learning and development strategy is indispensable to make our industry truly sustainable. Government changes to apprenticeships have provided a fantastic springboard to continue our industry-wide, circular-economy-driven mission for growth.